Through a case study of Lotte Reiniger, this chapter reflects on the kinds of language that are used to describe female film-makers and how they are subsequently positioned in the “canon”. 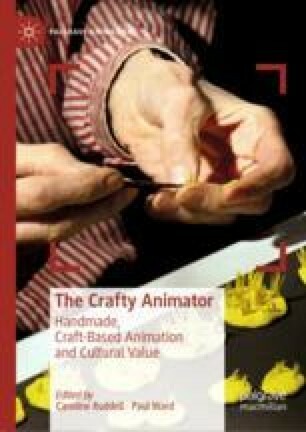 By considering Reiniger in terms of handmade, craft-based animation this chapter aims to highlight what kinds of cultural value such an animator might have, by providing analysis of her reception critically and publicly. We explore these ideas firstly by analysing the language employed to describe the form and aesthetic of Reiniger’s scissor cutouts and silhouettes; secondly, the language employed to describe Reiniger herself; thirdly, we consider how these discourses can be contextualised within the craft debates and ideas about gendered aesthetics, ultimately arguing that through certain “discursive reserves” Reiniger is undervalued compared to her male avant garde collaborators. We would like to thank the staff at The City Museum in Tuebingen and attached archives, The Film Museum in Dusseldorf, and the German National Library in Frankfurt for all their assistance and support in the writing of this chapter.